Only if your pricing is extremely simple (such as X euro per day or per hour), then you can simply enter the price per quarter / hour / day directly into the resource settings. Otherwise you’ll need to use Pricing Manager. This is a very user-friendly way of entering your pricing model into Planyo. 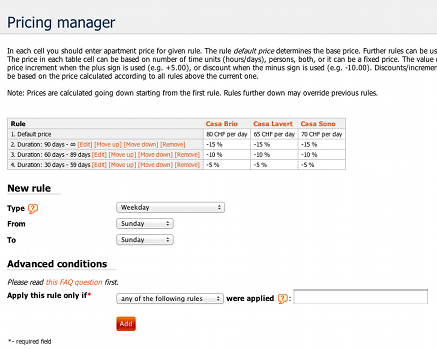 Even highly complex pricing models which may take an entire page to explain to your visitors in words can be entered. In the very rare case when this is not possible, please see the last section of this tutorial to see how any possible pricing model can be entered using a pricing script. Price override: when the price cell for given resource contains a number, e.g. 100.00, this simply overrides any previously calculated price. Most units are self-explanatory but unavailability message is simply a way of making the reservation impossible for a given condition. Please note that the administrators in such case will be able to make the reservation and manually override the price. Pre-payment amount is another special choice which is used to update the deposit (pre-payment) amount, instead of changing the total price. Additional info lets you add any text underneath the price to inform the customer e.g. of the way the price is calculated or the amount of deposit taken. You can use planyo's tags (see Q221) to make this text more meaningful. Special tags you can use are $(p) for the price calculated so far and $(d) for the deposit calculated by the previous rules. For example: Your deposit is USD $(calc:$(p)*0.20) would show the exact dollar amount of a 20% deposit. On top of simple conditions, a rule can also include additional (advanced) conditions. This is a very important feature, and it lets you tell planyo to make an adjustment or set the price ONLY if BOTH the condition in the rule is met AND another rule (or multiple rules) was applied or not applied. For example, you can say: apply this rule if the rule condition is met and if any of the previous 3 rules were applied. Or you can say: apply this rule if the rule condition is met and if none/all of the previous 3 rules were applied. This lets you set prices for complex scenarios such as: discount for a couple coming for at least 2 hours or price for a single person coming for exactly one hour. Please see the faq question Q181 for a very detailed description of the pricing manager and all the rules. Q191 explains the conditions.